As a self-described "skinny little runt of a kid," Nicky Coppola first discovered acting as an infallible way to escape getting beat up. It all started in fourth grade on the bus to school. He'd been harassed by a bully who stole his Twinkies, and finally Nicky decided he wasn't going to take it anymore. He went home, put on his brother's jeans and cowboy boots, slicked his hair back and found sunglasses to wear. In his clever disguise he approached the bully, introducing himself as Roy Wilkinson, Nicky Coppola's cousin. Roy told the bully that if he didn't leave Nicky alone, he'd get his a** kicked. The bully believed him, and stayed away. Another incident involved chasing a bully away with an Incredible Hulk routine, ripping his shirt off and screaming. He spent summers with his Uncle Francis in San Francisco, and says "those times are the best memories I have." He was always getting into trouble--he once lit a firecracker in his cousin's room and exploded a blender. "It was fun to be around him," cousin Sofia recalled. His father August taught comparative literature at Cal State Long Beach at the time, and exposed the boys to classical music, literature and film. "What I was doing wasn't academic," August explained. "I was opening up their minds and creativity." For a long time, Nic felt an intense need to be accepted and seen as "intellectual" by the father he idolized. Though his mother was often hospitalized for depression and absent throughout much of his childhood, Nic admits she greatly influenced many of his performances. "For lengths of time, she was naturally 'out there,' naturally surreal, with all kinds of poetry flying out of her. It gave me an original perspective." When he was 12, his parents divorced and agreed that the boys should live with their father. They then lived in San Francisco for a short time. At the age of 15, Nicolas decided to become an actor while watching East of Eden. He could relate to the character played by James Dean, and the need to please his father. "It had a profound effect on me." That was when he knew he wanted to become an actor. He enrolled in the Young Conservatory, part of American Conservatory Theatre in San Francisco, but only spent one summer there. When his family moved back down to Southern California, he attended Beverly Hills High School. He did not have an easy time socially and described himself as "a dork." He found it difficult to ask girls out, "because I was taking the bus to school every day and they were with their boyfriends and I didn't have a car. It was an unfortunate social pressure." Contrary to popular belief, he did not drop out of high school but left early after passing a proficiency exam. With the help of his uncle, Nic soon fulfilled his dream of being a paid actor. As he began working, Nic realized that being the nephew of a successful director has its drawbacks. Envious cast members would hang around his trailer and joke, "I love the smell of Nicolas in the morning," in reference to Robert Duvall's line in Apocalypse Now, "I love the smell of napalm in the morning." It wasn't until he auditioned for Valley Girl under the name Nicolas Cage that he no longer felt the burden of the Coppola name. Director Martha Coolidge even admitted that if she'd known he was a Coppola, it would have "colored her perceptions." He'd toyed with many different names before deciding on Cage. Nick Blue (his favorite color at the time), Nick Faust, Nick Mascalzone (his great-grandmother's nickname for him, it means "bad boy" in Italian)...He eventually decided on Cage as a tribute to black comic-book superhero Luke Cage and composer John Cage. In his early 20s Nic was well-known, not for his performances but his off-screen antics. He was rumored to have trashed his trailer on the set of The Cotton Club and gotten his teeth pulled without Novocaine for Birdy, the latter of which he says is untrue. He did however, eat a live cockroach for a scene in Vampire's Kiss. He has since continually been associated with cockroaches, which he resents. "Cockroaches are NOT on my menu, believe me," he said in an MTV interview. He was unmercifully pounded by critics when he starred alongside Kathleen Turner in Peggy Sue Got Married. His uncle Francis was directing and had allowed Nic to distort the character a bit. Nic decided he was going to incorporate buck-teeth and a Pokey (from Gumby) voice into it, much to the dismay of many studio executives who wanted him fired. They had gotten so riled up, Francis had to have them all over for a spaghetti dinner to persuade them that the film wasn't ruined and everything would be alright. The critics were unforgiving though, and one reviewer went so far as to call him "a wart on an otherwise beautiful film." The first movie Nic starred in that went blockbuster was Moonstruck. He'd been singled out for the role by Cher, who enjoyed his performance in Peggy Sue. He says that his performance was fueled by the pain of his breakup with actress Jenny Wright. His performance was intense and much darker than the script and director Norman Jewison had intended. Though much of his work was cut to make sure he wouldn't "overshadow" the bigger stars in the film, he still received a Golden Globe nomination. After Moonstruck, Nic felt he wanted to do something entirely different, so he gave his all to Vampire's Kiss. He was really into German expressionistic acting and used that style in the movie, shoulders raised and eyes bulging, a man gone mad. In one part of the script, Nic's character was supposed to eat a raw egg, but Nic as usual had a better idea. He was terrified of bugs but thought that eating a cockroach would better affect the audience and help him get over his fear. Apparently it didn't work-- Nic says he had nightmares for a long time after the filming. In addition, director Robert Bierman made him do two takes, which means he ate TWO cockroaches! The performance must have drained him because he took a long hiatus soon after. While Vampire's Kiss was certainly his most unique performance, one of his most loved movies (at least by hard-core Cage fans) is Raising Arizona. It was the first film in which he showed a real mastery of comic-acting while never losing his intensity. When Nic began working on Leaving Las Vegas, he had just broken up with his fianc Kristen Zang and a lot of the emotion poured out into the film. To prepare for the role, he took a trip to Ireland with friend Phil Roy to experience "some essence, some soul, in the land of great writers and drinkers." He also video-taped himself drinking gin and talking to the camera to study the slurs in his speech while intoxicated. As soon as the Oscar nominations were announced, Nic was declared the "frontrunner", the "shoo-in," which he said "really messes with your head." When Jessica Lange announced his name as Best Actor, he hurried up to the stage looking and sounding like he'd just ran a marathon. Relieved and happy, he gave a breathless but beautiful acceptance speech with a special "I love you" to his son Weston at the end. Afterwards, he made the press laugh explaining why he wore a Hugo Boss tuxedo (No one else would touch him after he was voted "Worst Dressed Man" in People magazine.) About a week later, his wife Patricia sent him a beautiful love note--"It said, 'Before, women wanted you. But when you went up there you had my lipstick on your face. It was a win for every married couple and celebration of marriage.'" To keep "mixing it up," Nic decided to take on an action movie after Leaving Las Vegas. When asked about why he decided to do a mainstream action film like The Rock, a first for him, he explains that he wanted to play a character that was a sensitive action hero, one that actually doesn't want to kill people in order to be a hero. Apparently now comfortable with the genre, he is going on to make two more, Con Air and Face Off. While the idea of actors who do their own stunts has become more popular in Hollywood, Nic refuses to take part. "I want to be around to see my kid grow up." --Jenny Wright, actress (Near Dark, The World According to Garp). --Kristina Fulton, actress (The Doors), who is also the mother of his son Weston. -- Kristen Zang, model, to which he was engaged. -- Uma Thurman, actress (Pulp Fiction, Beautiful Girls). -- Samantha Mathis, actress (Pump Up the Volume, Broken Arrow). He has been married to actress Patricia Arquette(Beyond Rangoon, True Romance) since April 8, 1995. Weston Coppola Cage, born 1992. Beach house in Malibu, German castle in the Hollywood Hills referred to as "Chez Cage," apartment in Los Angeles Latino neighborhood (makes it easy to go incognito), and a Victorian mansion in San Francisco's Pacific Heights. He has also mentioned that he is thinking of moving to Manhattan. Lamborghinis (several), Ferraris (several), '67 metallic-blue Corvette Stingray nicknamed the "Blue Shark," '67 Chevelle, "a truck," and a Bentley in which he is usually chauffeured. Favorite Type of Music: "I dig it all." Jim Carrey (actor), Phil Roy (songwriter), Tom Waits (singer), Cary Elwes (actor), Charlie Sheen (actor). He also hangs out with his cousins Roman and Sofia a lot. He loves to write--short stories, screenplays, poems. He has also mentioned designing cars, and "starting a music company and a comic-book company." 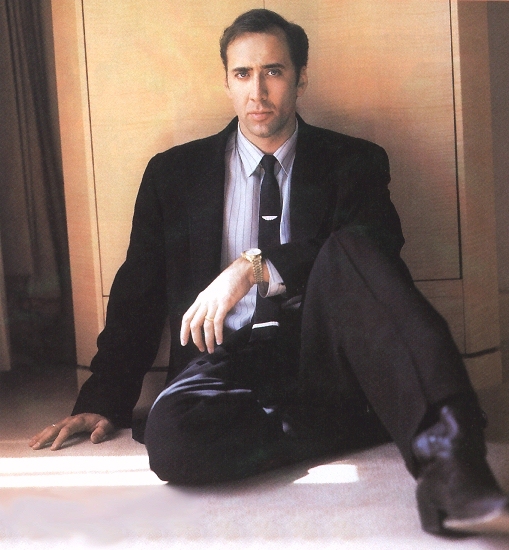 N an industry in which everyone longs to be tagged a brooding, edgy rebel, Nicolas Cage is the genuine article. During the course of his movie career, Cage has had two teeth yanked out sans Novocain (while filming Birdy, 1984), has trashed his trailer in a fit of spleen (The Cotton Club, 1984), and has eaten a live cockroach on camera (Vampire's Kiss, 1989). Now there's a guy who will do anything for art. Born Nicholas Coppola in suburban Los Angeles to dancer-choreographer Joy Vogelsang and comparative literature professor August Coppola, much of his childhood was marred by his mother's severe depression an illness that kept her hospitalized for years (she has since recovered). The future actor and his two older brothers were, for the most part, raised by their father, who instilled in his sons an appreciation for great works of art, literature, and cinema. Summers usually included a lengthy vacation in San Francisco, where the Coppolas would visit Dad's brother, director Francis Ford Coppola. At age 15, Nicholas, who had devoted many childhood hours to staging scenes from comic books and television shows, devoted one such family holiday to attending a summer-long acting class at San Francisco's American Conservatory Theater. Back in L.A., Nicholas led a decidedly more middle-class existence than either his wealthy Bay Area relatives or his fellow students at Beverly Hills High School. He hated school and opted to take the G.E.D. exam in eleventh grade. After getting his certificate, Nicholas landed a part as a surfer dude on a short-lived TV series called The Best of Times (1980-81), and made his feature film debut in a small role in Fast Times at Ridgemont High (1982). Determined not to coast to success on his uncle's coattails, Nicholas Coppola changed his name to Nicolas Cage, after a comic-book character named Luke Cage. Still, he was not averse to accepting work in his uncle's troubled-teen flick Rumble Fish (1983). That same year, Cage achieved his first glimmerings of stardom for his hangdog leading-man performance in Valley Girl. Cage again stepped in front of his uncle's cameras to star opposite Kathleen Turner in Peggy Sue Got Married (1986). Because he then made a point of varying his voice and appearance from film to film, Cage delivered an overly experimental performance that elicited terrible reviews from co-stars, studio executives, and critics alike. His lambasted piece of work did, however, benefit his career in two important ways: it mercifully guaranteed that he would never again make another teen movie; and it piqued the interest of both Cher and the moviemaking Coen brothers. Cher lobbied to have Cage cast as her love interest in 1987's Moonstruck, and the Coens sought out Cage for his first adult comedy, Raising Arizona, that same year. 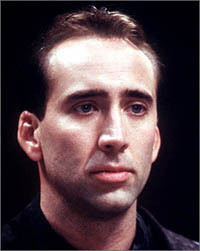 Both movies helped cement Cage's reputation as a quirky yet charming everyman, and those roles yielded similarly off-kilter assignments in Vampire's Kiss (1990) and Honeymoon in Vegas (1992). By 1994, Cage had established a healthy, if not entirely fulfilling, movie career. He commanded roughly $4 million per picture and had his pick of a steady flow of decent scripts. When director Mike Figgis asked him to appear in 1995's Leaving Las Vegas, a low-budget, independent picture about a suicidal alcoholic, Cage found something he could throw his heart into. He signed on to play the doomed protagonist for the relatively paltry sum of $240,000, but the role paid off in other ways: Cage earned the most laudatory reviews of his career and a Best Actor Oscar to boot. He next delved into the action genre, playing an FBI chemical warfare expert in The Rock; a heroic ex-con in the hijacking-themed Con Air; and a sadistic criminal mastermind in the John Woo thriller Face/Off, in which he co-starred with John Travolta. On the mushier side, Cage played a celestial being who romances Meg Ryan in City of Angels, a 1998 weepie inspired by the Wim Wenders classic Wings of Desire. He next returned to the lucrative action-hero arena for Snake Eyes, which co-starred Gary Sinise. In 1999, he turned to producing with the indie film Shadow of the Vampire, about the making of the silent horror film Nosferatu, and joined the $20 million actor's club for his role in Gone in 60 Seconds, released in 2000. Later in the year, he co-starred opposite Ta Leoni in the holiday drama The Family Man, a road-not-taken tale that positioned him as a single Wall Street type who gets the chance to see how his life would have turned out had he married his college sweetheart. Also in a romantic vein was his title performance in the summer 2001 release Captain Corelli's Mandolin, director John Madden's restrained adaptation of the Louis de Bernires novel about the inhabitants of a sleepy Greek island swept up in World War II. Off-screen, Cage has always played the role of movie star to the hilt. He currently divides his time between an ever-growing number of over-the-top abodes, including two homes in the L.A. area. ; a Victorian mansion in San Francisco; and a faux-German castle in the Hollywood Hills, decorated in an eclectic style he terms "hot-rod Gothic." He boasts a swank wardrobe and an equally swank fleet of European sports cars. 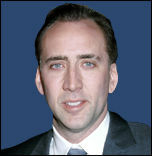 A dedicated actor, Cage spends considerable time preparing for his roles, gleaning as much information as he can about each character's world. He also manages to work out twice a day, write poems and stories, and juggle a busy social schedule. He married actress Patricia Arquette, whom he had dated briefly eight years earlier, in April 1995 after a lightning-fast courtship. Both Arquette and Cage come from show-business families and each has a son from a previous relationship. The couple, who starred together for the first time in Martin Scorsese's 1999 film Bringing Out the Dead, agreed mutually and amicably to divorce in November of the following year. Cage, who has impersonated Elvis Presley in a number of films, is currently keeping company with the King's little princess, Lisa Marie. For those who faithfully followed him through the lean years of obscure, offbeat independent roles in such films as Valley Girl, Raising Arizona, Vampire's Kiss, Wild at Heart, Birdy and on to his Oscar-winning triumph in Leaving Las Vegas, it comes as no surprise that Nicolas Cage's recent ascent to superstardom has stifled neither his popularity nor the diversity of his choices. After a trio of action films (The Rock, Con Air, Face/Off) that had many proclaiming him Hollywood's next big action star, Cage went on to defy expectations by segueing into the ethereal romance of City of Angels. In his latest film, director Brian De Palma's Snake Eyes, Cage again shatters expectations as Atlantic City police detective Rick Santoro, a not-so-straight arrow whose vices include a penchant for gambling and its associated illegalities. Naturally, when childhood buddy Kevin Dunne (Gary Sinise) offers him a ringside seat at a heavyweight title fight where Dunne is managing the security detail for the United States Secretary of Defense, Santoro just can't bring himself to turn it down. But when the Secretary is assassinated mere inches from him, the reluctant detective is compelled to take charge before all hell can break loose, racing against time to unravel the conspiracy before its nefarious instigators can sweep it under the rug. Scripted by David Koepp (The Lost World: Jurassic Park, Mission: Impossible) from an original story by De Palma and Koepp, Snake Eyes marks yet another invigorating departure for which even Cage's most ardent fans may be unprepared. Both sincere and self-serving, Santoro has already been called Cage's most internally complex character to date, a film noir-style hero with a personality as unpredictable as his ethics. Just as unpredictable, in fact, as Nic Cage himself. Last year you were supposed to be "the new action hero," and now you've thrown everyone off by doing City of Angels and Snake Eyes. What are you doing to us? I'm just doing what I've always done, trying to keep changing and to keep the work interesting for me and not become calcified in any one type of movie. Considering that every director now wants to work with you, and every star wants to work with Brian De Palma, what made this pairing so ideal for you both? I was a fan of Brian's movies, obviously. And I read the David Koepp script, which was very good. But when I had dinner with both Brian and David, it became clear to me that much of what was in Brian's mind, visually, wasn't really on the page in the script, and that what David had written was a structure that enabled Brian to work his wizardry. The two had formed a symbiosis that seemed very exciting, and it occurred to me that this would be pure cinema. So I wanted to participate in it. My own take on things is to try to experiment and switch things around and look for something more unique than is necessarily on the page. And Brian is very encouraging of that, and I feel he does the same with the camera. So the two of us really hit it off. We have similar sensibilities. We are, in some ways, very similar as people, and I came out of it with a new friendship. So it was a good marriage for us. How challenging was it to work with De Palma as opposed to some of the other visual stylists you've worked with? It was definitely more challenging in some ways. The fact that he wanted to do those long takes at the beginning of the movie. I'd never done anything like that before. He'd call it "No Net Productions" because it was like we were all on a high wire. I had mountains of dialogue, and I knew I had to talk fast to get it all out. And if I dropped a line or flubbed a word, we had to go all the way back to the beginning again. And sometimes that was frustrating because something special would happen in a take but it would be lost because we were going for this continuous thing. And then the steadicam people were working their butts off trying to make sure that everything looked right. It was the most intense symbiosis I've ever had with a camera in that all the moves with the camera were choreographed together. It was a thrilling rush, but at the same time quite scary because you felt the pressure. We'd rehearse it and rehearse it all day, and then we had one hour to get it at the end, sometimes. So we'd just go for it knowing that the chips were up and that we had to do it. Most stars would resist playing a hero like Santoro who is, in many ways, really not very heroic. Well, it's always more interesting to me when the guy you think of as the louse does something that saves the day because it's more unexpected, it's surprising. And it says something that fits in with this whole piece, which is that nothing is really what it seems to be, that there's a conspiracy. And Rick (Santoro) himself is the guy who's wearing the black hat. But then you discover he's the guy who, when push comes to shove, knows what he's going to do. I think characters that are more complex generally are more interesting than the cut and dry, black and white. I'm not interested in that as much. I like flawed characters, I like characters with problems who try to overcome their problems. You keep such a rapid pace of projects going. Is it because you see stuff you don't want to pass up or because you feel an urgency to keep working? It's a little bit of both. When I did Leaving Las Vegas, and then The Rock came out, everything sort of came into focus with the previous work that I'd done. I'd always had a devoted but small fan base that got me, but by and large the majority never really did. When that happened with Leaving Las Vegas, the earlier part of my work came into focus, and suddenly scripts came to me that I never really had the opportunity to try before. So I became like a kid in the candy store, thinking, "Wow, this is great. I can finally work with the people I want to work with and make the movies I want to make." But there is also a sense that I use acting and work as a means to keep me balanced, it keeps my life balanced. So I'll keep working as long as they let me. On the unlikely chance that you were to have a slump, then what would you do to keep balanced? I'd write. I've been through slumps, and I tend to write scripts or stories. I find ways of occupying myself. Right now I'm just trying to write family dramas and things that are interesting to me on a level that is more of a personal vision, but with directing I kind of came to a crossroads about six years ago where everyone was saying, "You should direct!" But to direct a movie takes a year out of your life, and I decided that I wanted to keep acting. And I'm glad I made that decision because by doing that I really feel that I really honed my instrument, I became much more experienced and learned to understand the industry better. And that's part of why I got where I got, because I kept at it. I think if I'd gone into directing, I might have slowed the whole process down and had to rethink everything, and then maybe I wouldn't have been in a position to pick and choose the material that I have. Is it also important to maintain that balance by producing other people's work as you're now doing through your own company? It is, in that many times there are movies and genres of films that I enjoy, but I'm not ready to act in them or don't really know if I should act in them. For example, I like Hot Wheels toy cars. I liked them as a child, so I talked to Mattel and said, "What do you think about a Hot Wheels movie?" I've tried to get Jerry Bruckheimer involved in that. I'm probably not going to be in it, but I think it would be a lot of fun for children. Also, it enables me to make movies that are probably of a smaller scale that way I can have a little more control over them. Another picture I have, which I'm very excited about, is about F.W. Murnau [tentatively titled Shadow of a Vampire], the great German filmmaker, and his experiences making [the silent horror movie] Nosferatu. We have an offer out to Willem Dafoe to play Max Schreck who, in fact, is a real vampire in the movie. And then we also have an offer to David Bowie to play Murnau. And you wouldn't want to play in that? Well, I would, but I'm so excited about the possibility of working with Bowie, that I'd love to see him in it. Is Superman done for you? I've been very accommodating to that movie, and I've taken a lot of heat in the press on it. I'll remain loyal to it because I think it's a tremendous challenge, and it's exciting, but I've moved on to other things. What heat have you taken? Just that I wasn't really the type, I'm not your classic concept of what Superman should look like, I'm more "everyman," which to me is interesting in that we've done the classic Superman and done it well. But if an everyman can be Superman, then that means that we're all Superman. And I like that theme as well. So what was the main problem in getting it off the ground? The main problem was that the script came in very expensively. And to me it was worth the gamble because if you love the Superman character and the Superman universe, especially with a guy like Tim Burton, you're going to create a fantasy that's going to be a visual feast, and people are going to go see it. But the studio felt that this was their most important franchise, and they wanted the script to be great. And they felt that it was good but not great, so they're going to keep working on it. We heard your son gave you advice about wearing Superman's red shorts. Do you consult with your family on roles? That was a special case because Superman belongs to the child's universe, and I wasn't sure I was going to wear the red underwear. I took some pictures in it, and he said, "Where is it?" And I said, "I'm not going to wear it." And he goes, "Well, why? Are you embarrassed?" And I said, "Well, yeah!" But he was so adamant that Superman has that. And he was right. Everybody remembers that. It's part of the look. So I went back to Tim and decided to do it. But I'm open to everybody's suggestions. I welcome opinions and suggestions as part of my process. It stimulates my mind to think about the character. And in that case, I think any child's opinion is important to me. With so many action films underperforming this summer, do you think the genre is burning itself out? I think it is. Sometimes it's kind of hard to figure out where all the money goes. These hype machines are starting to wear audiences down in general. It's definitely making studios more cautious. There's a much more careful eye on all of this, and that's part of what happened to Superman. Did the lackluster reception of Batman and Robin last summer impact it as well? I think there's a certain trepidation about comic book movies in general right now. But being on the A-list has to have given you greater freedom in other ways, too. It feels great. It's what I've worked hard for since I was 17, for the last almost 20 years. And it's been an uphill battle. When I decided I wanted to be in comedies, I had to screen test to get into Honeymoon in Vegas because people thought, "Here's the guy in the snake jacket with the wooden hand. He's crazy, he's not going to be funny." And then when I wanted to be in action movies, that also was a wall I had to break down. Nobody really perceived me in each of those genres because nothing in my previous work suggested I could do it. But now I'm feeling very good. I feel like I've done it and I'm very thankful I've been recognized in it. And now that I'm exactly where I always wanted to be, I'll just go back and forth and find things I want to do. It's very important to me, though, that whatever I do, I'm giving people their money's worth. The death is if you don't do your job well. And I've always tried to do my job well. Was there a time when you felt you weren't really getting where you wanted to go? I felt that, pretty much, all the way up to right before I did Kiss of Death. I did Kiss of Death and then I did Leaving Las Vegas and then after that everything changed. But up 'til then I was always frustrated by the roles I got. Are there any plans to work with your wife, Patricia Arquette? There's a lot of desire to do a project together, but it hasn't happened for some reason or another. I think the studios generally don't feel that married couples are good box office. And my opinion is that they think there's a lack of mystery there. If these two are in love and together, there's nothing to root for, there's no suspense. I used to have this thing I called my "sunshine trilogy," and now I'm in my "midnight trilogy." Eight Millimeter is a very, very grim, scary movie, and then I'm going darker still with Bringing Out the Dead which is a Paul Schrader script that Martin Scorsese's directing. It's sort of like "my life as a paramedic driver." So I'm going to be going out on runs with the emergency vehicles in South Central so I can watch what they do and be around that. But it's going to be kind of strange because I just played the angel in City of Angels, and I don't really want to walk into a room with this family that's in a state of grief and shock and be like, "Hi! Here I am!" I'm a little bit conflicted about it. Well, I wanted to work with Scorsese, and I felt that what paramedics do is so important to the community, and people don't really know what they do. When they get there, it's like, "You're late!" or "Couldn't you come any faster?" or "It's about time!" or "Don't take me to the hospital!" and all that. But Marty would say that they're saints. And I think it's important that people know what these people go through. But that doesn't necessarily make a good movie. Well, I think that the auspices are good. I don't know that it'll make an entertaining movie. I know that it'll make a powerful film and an interesting film. I think that Schrader is an excellent writer and Scorsese is a great director. So I feel confident that it has a good shot at being an excellent movie. Now that you have two years of perspective on winning the Oscar, how has it influenced your life in positive and negative ways? It's all been positive for me. I've not dwelled on it. I don't think about it. I've gone on to do the movies that aren't necessarily Oscar fodder, and I think that's important, not to get trapped. I've seen a lot of actors get high on their own importance with the Academy Award, and they snob themselves right out of the industry thinking that they have to do this very pretentious work sometimes. I don't think you can neglect the fact that there is entertainment in this business, and that it's valid to go to a movie and get your mind off your problemsthat's important to people. What I've always wanted to do is to do both, to do something that's stimulating and exciting on an escapist level, but also to do movies that are a bit more thoughtful and thought-provoking and poetic. So it's the balancing act of the two.